When making a list of the most beautiful places in the world, Australia is definitely going to be listed for very many apparent reasons, ranging from its beautiful nature, fantastic culture, beautiful cities, hospitable people, to a whole lot of other factors that make the place amazingly unique. Little wonder why more people are choosing the place as a travel destination and the people who are already there are seeking permanent residency in the country. If you are one of such people seeking for Australia PR Visa, then you are in luck today as we will discuss one of the avenues (subclass 485) to help you achieve just this in this article. 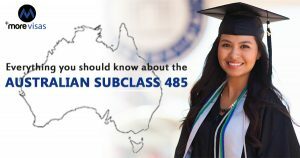 The subclass 485 is a kind of temporary Graduate visa that allows international students in Australia who have stayed for and completed at least two years of study in the country the opportunity to live and work in the country for the duration of 18 months to four years, depending on their qualifications. This Subclass 485 provides immigrants for Immigration to Australia with the perfect chance to extend their stay in the country while also giving them a better opportunity to improve their eligibility for an Australia PR visa. The Post Study Work Stream: This stream is meant for immigrant students who have completed at least a two years bachelors degree program at a higher education institution in Australia and it allows them to stay for up to four years (depending on the qualifications of the applicant). This stream does not require the applicants to nominate an occupation on the Skilled Occupation List. The Graduate Work Stream: This stream requires applicants to nominate an occupation on the Skilled Occupation List (SOL) and it is open for students who have completed at least two years of study in this nation in a field that relates with the occupation nominated. • The applicant must have a good command of the English language and will be tested to this effect. • The applicant must meet the two years study requirement and must have completed the qualification within six months of the application. • The applicant must be in the country when the application is made. • The applicant must maintain a private health insurance during the duration of a skilled graduate visa. The holder of the Australian 485 visa is entitled to ‘unrestrictedly’ live and work in this nation temporarily. The holder of the 485 visa is also entitled to travel in and out of Australia as long as it is valid. The subclass 485 allows immigrants the golden opportunity to extend their stay in the country, and it also gives applicants the opportunity to include their partners/spouses and their dependent children in the visa program. If you are planning for immigrating to Australia don’t worry; MoreVisas – India’s Most Eminent Visas and Immigration Consultant, who will assist for the processing of successful visas.